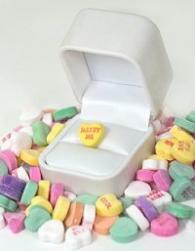 Do you want to get engaged on Valentine's Day? For some couples, getting engaged on Valentine's Day is the most romantic possible way to take their relationship to the next level, while for others, the holiday is a poor substitute for more creative, personalized marriage proposals. With the proper planning, however, this holiday can be romantic and memorable for any couple about to be engaged. Easy Planning: Many restaurants, spas, resorts, and other romantic spots have ready-made Valentine's Day packages available that can add extra romance to your special moment. Romance: With hearts, roses, chocolates, and diamonds as the time honored symbols of this holiday, it is no surprise that such built in romance is perfect for marriage proposals. Intimacy: Unlike Christmas, Thanksgiving, and other big holidays, Valentine's Day is usually a private, intimate holiday without large family commitments or parties. This gives couples the perfect opportunity to spend time together cherishing their decision before announcing their engagement to the world. At the same time, getting engaged on Valentine's Day does have some down sides that make it less than ideal for many couples. Predictability: If a couple has been talking about getting engaged and even discussing engagement ring designs, popping the question on Valentine's Day may not be the romantic surprise it was intended to be. Diamonds, hearts, and roses are common. Less Unique: Because so many couples get engaged on Valentine's Day, it would not be unusual for couples to need to share the spotlight with other friends or couples who have chosen to make the same commitment on the same day. For example, more than one couple may be having a candlelit dinner in the same restaurant with the plan to pop the question over dessert. Expense: The costs of flowers, jewelry, and romantic getaways skyrocket in mid-February, making it a more expensive time for any elaborate marriage proposal. If a couple's idea of the perfect proposal involves two dozen long stem roses, it would be more budget friendly to pick a different date to propose. 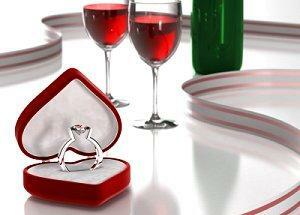 Poor Timing: Even though so many couples get engaged on February 14, it isn't the perfect time for everyone. A couple will have a happier relationship if they are sure they are ready to get engaged instead of letting a calendar date dictate that now is the time. Despite the challenges of Valentine's Day proposals, it can still be a romantic and memorable time for a couple to share as they pledge to spend their lives together. The key to the perfect Valentine's Day engagement is to make it unique and meaningful. Flowers: Instead of choosing the ever popular roses to accompany the marriage proposal, use a bouquet of more exotic and beautiful blooms, particularly if the woman's favorite flower is something other than a rose. Romantic Getaway: Propose on vacation by booking a weekend trip near Valentine's Day. A short cruise, a stay in a quaint bed and breakfast, or a luxurious getaway to an all-inclusive couples resort are perfect options. Surprises: Instead of a cliché marriage proposal on bended knee, opt for a surprise proposal that is more customized and exciting. Symbolism: Incorporate the symbolism of Valentine's Day into the proposal with a heart shaped diamond engagement ring, or engrave the ring with a sweet sentiment such as "Will you always be my Valentine?" Privacy: Keep the proposal private and meaningful by choosing to pop the question in a significant place, such as where you first met or where you first kissed, instead of the latest romantic hotspot in town. Embrace Cliches: For a more whimsical proposal, embrace the Valentine's Day clichés to your advantage. Attach the ring to a pink teddy bear, root through a bag of candy for every heart that says "Marry Me", or rent a Cupid costume for a humorous proposal that has fun with the holiday. Couples who choose not to get engaged on Valentine's Day can still celebrate their new status on this romantic holiday. Getting engaged on Valentine's Day is not right for every couple, but it can be a romantic and memorable way to get engaged if planned properly.